Punt, Pass & Pork: Oregon's Mark Helfrich belongs in talk of nation's top coaches; more college football analysis after semifinal games. EUGENE, Ore. -- Rudy Carpenter wasn’t sure if his favorite position coach had enough of a ruthless streak to be a successful head coach. Carpenter, who played quarterback for Mark Helfrich during his true and redshirt freshman seasons at Arizona State, worried Helfrich might be too nice, too patient, too … normal to helm a major college program. When the College Football Playoff field was announced on Dec. 7, this classic Sesame Street tune seemed the most appropriate. Nick Saban, Urban Meyer, Jimbo Fisher and … Mark Helfrich? One obvious difference was that the first three had all had at least one national title on their head coaching résumés. Helfrich did not. The other major difference? Of the four, Helfrich seems like the only one who could make small talk with his neighbor over the fence. Chip Kelly, the guy Helfrich replaced in Eugene, would’ve fit right in with the other three. Helfrich seems like an outlier, but he is one win away from joining the same club as Saban, Meyer and Fisher. His Ducks whipped Fisher’s Florida State team 59-20 in the Rose Bowl, and a victory next week against Meyer and Ohio State would allow Helfrich to give Oregon something even Kelly could not -- a national title. And Helfrich could do it using a management style that seems rare in college football. That common touch may make Helfrich seem like a mere caretaker for the machine Kelly built, but Helfrich has Oregon playing at a level it rarely reached during Kelly’s tenure. It would be easy to lump Helfrich in with former Miami coach Larry Coker, the internal hire who took an obscenely talented roster left behind by Butch Davis and rolled to the 2001 national title. Yet Helfrich seems capable of keeping the Ducks at this level. He was, after all, the assistant who identified and landed quarterback Marcus Mariota. He was the one who came from Colorado, where he had been offensive coordinator, and fully embraced Kelly’s warp-speed attack. He was the one who, instead of looking outside when defensive coordinator Nick Aliotti retired, elevated assistant Don Pellum and kept intact the ethos of a unit that -- through trial and error -- was crafted to work in harmony with Oregon’s offense. 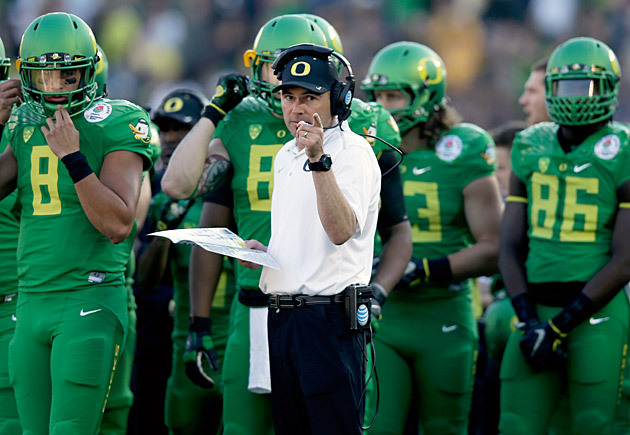 If the Ducks can win next week, the perception of Helfrich will move beyond caretaker. He’ll rightfully be in the same league as Meyer and Saban. Helfrich’s boss already feels that way. Oregon athletic director Rob Mullens was reminded during an interview on Saturday that at $2 million a year, Helfrich remains a relative bargain compared to the 50 coaches with higher base pay who do not have their teams in the national title game. Win or lose next week, Helfrich will get a new deal that moves him closer to Meyer but might only be a little more than half of what Saban makes. Though it may seem to outsiders that Nike founder Phil Knight gives Oregon a blank check with which to run its athletic department, Mullens must be more frugal than many of his peers. Fortunately for Mullens, Helfrich likely won’t attempt to stretch the limits of the supply and demand curve even though his 24-3 career record suggests he could. He doesn’t seem to have any interest in the NFL, and is already coaching a title contender in his own state. That Helfrich is comfortable in his role and in his own skin while embracing Oregon’s brand makes him the ideal candidate to bring the program Rich Brooks, Mike Bellotti and Kelly crafted to the pinnacle of the sport. Indianapolis Colts (and former Notre Dame) safety Sergio Brown captured America’s imagination on Sunday when he channeled Ric Flair to celebrate his team’s playoff win over the Cincinnati Bengals. Here are the top 10 catchphrases from professional wrestlers who worked before I stopped watching wrestling at age 14. 1. “Wooooooooooooooooooooooooo!” -- The always stylin’ and profilin’ Ric Flair, who once delighted a group of Florida walk-ons by exclaiming this while exiting an elevator at the Hilton Riverside in New Orleans during the run-up to the Sugar Bowl on Jan. 2, 1997. 2. “To be the man, you’ve gotta beat the man.” -- Flair again, because nobody was better on the mic and because college football players unwittingly (or wittingly) quote him at least five times a year. 7. This, from wrestler Rowdy Roddy Piper, came in a movie called They Live, but it would have worked on Piper’s Pit. 8. “What a rush!” -- Road Warrior/Legion of Doom member Hawk, who is not the father of former Ohio State linebacker James Laurinaitis. That would be Animal. 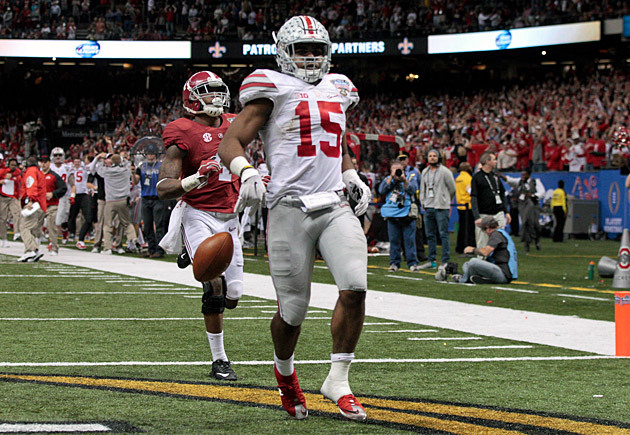 Just as the image of a helmetless Earl Everett tackling Troy Smith in Florida’s BCS title win over Ohio State in January 2007 helped change the perceptions of the SEC and Big Ten, the video of Ohio State tailback Ezekiel Elliott outrunning Alabama’s entire defense for an 85-yard touchdown during Thursday’s Sugar Bowl should do as much or more to help reverse those perceptions. Elliott’s run is the product of two great blocks and an abundance of speed. The first block comes from wide receiver Evan Spencer, who wipes out Alabama freshman linebacker Shaun Dion Hamilton. The second comes from left guard Billy Price, who pulls to the play side and occupies Alabama safety Nick Perry long enough for Elliott to run past. There are some poor angles taken by the remaining Alabama defenders -- no one ever talks about Ess-Eee-See Geometry -- but Elliott is flat flying and probably wouldn’t have been caught anyway. Oregon led by five points early in the second half of Thursday's Rose Bowl when linebacker Derrick Malone Jr. made perhaps the most important play of the game. The Ducks had struggled to stop Florida State freshman back Dalvin Cook, and were struggling again as Cook took a handoff on second-and-10 from the Ducks’ 41-yard line. Cook broke through the first level and raced into the secondary. In the process, he passed Malone. Yet rather than quit on the play, Malone did as he was coached. “Magical things happen when you run to the ball,” he would say later. There was nothing magical about what Malone did next. 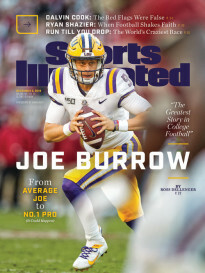 It was pure hustle and, as LSU coach Les Miles would say, “want.” As Cook reached the Oregon 31-yard line, Malone reached in and ripped the ball from the Miami native’s hands. Malone didn’t poke the ball loose; he simply took it away. The takeaway started a chain reaction that helped the Ducks put the game away before the fourth quarter began. Had Malone decided not to give chase and the Seminoles continued their drive to the end zone, the dynamics of the game could've changed completely. Instead, Malone gave the ball to Oregon’s offense, which needed all of 92 seconds to score. Baylor dialed up the ultimate Fat Guy TD when the Bears somehow found a No. 80 jersey that would fit 390-pound guard LaQuan McGowan and told McGowan to line up at tight end and go out for a pass. Michigan State defenders, who likely thought that no one would throw to a 390-pound man, declined to cover McGowan. Beauty happened. The Bears wound up losing the Cotton Bowl 42-41, but they will hold the Fattest Guy TD record until it is broken by a 400-pounder. Two days after the McGowan score, Oklahoma State coach Mike Gundy one-upped Baylor’s Art Briles by lining up 300-pound defensive tackle James Castleman at quarterback in the first quarter of the Cowboys’ 30-22 win over Washington in the Cactus Bowl. The Wild Fat formation worked to perfection when Castleman took the snap and pounded his way to a one-yard touchdown run. Castleman took his Fat Guy/Skill Guy performance to the next level in the fourth quarter when he lined up at fullback, went in motion and caught a pass in the flat. He then thundered down the right sideline for a 48-yard gain. This category is supposed to honor more standard lineman performances, and we’d be remiss if we didn’t note the return of Oregon center Hroniss Grasu from a lower left leg injury in time to help the Ducks make the title game. After the Rose Bowl, I asked Grasu -- who hadn’t played since Nov. 8 -- when his leg began to feel steady enough to play again. “That’s a great question,” he said with a chuckle. If Grasu was still favoring the leg, it didn’t show. He moved fluidly and handled a tough assignment (Florida State defensive tackle Eddie Goldman) well. The Ducks averaged 6.7 yards a carry and didn’t allow a sack. 1. You already know the playoff concept worked because it provided a great viewing experience on Thursday and because it proved the BCS -- which would’ve matched Alabama and Florida State -- would have gotten the title-game matchup wrong. But TV ratings are hard proof the playoff succeeded, and they will only fuel speculation the concept will expand beyond four teams sooner rather than later. According to Nielsen, the Rose Bowl drew 28.2 million viewers and the Sugar Bowl drew 28.3 million. Both games appeared on ESPN. Compare that to the 25.6 million viewers last year’s BCS title game drew for ESPN. Or compare it to the NFL Wild Card showdown between the Arizona Cardinals and Carolina Panthers. The first NFL playoff game broadcast on ESPN averaged 21.7 million viewers. The game between the Baltimore Ravens and Pittsburgh Steelers on NBC drew 28 million viewers, but the fact that college games broadcast on cable can draw an audience equal to an NFL playoff game broadcast on a network suggests that ESPN will get its money’s worth for the almost $500 million a year it will spend to secure the rights to the playoff and the other four New Year’s Six bowls. It also suggests that viewers crave January games with high stakes. (Anyone with common sense already knew that.) So why not add four more? The quarterfinals of an eight-team playoff -- or a two-game first round of a six-team bracket -- would likely draw nearly as many viewers before the semifinals and final are even played. There might be some drop-off for the early-round games, but the audience size would command huge dollars from ESPN. Obviously, no major structural changes need to be made based on the first year. But if these numbers remain consistent through the first six years of this 12-year deal, the potential windfall might be too great for schools to turn down. They might find a way to stage playoff games on Jan. 1 and then during the next two weeks. Of course, early-round games would need to be hosted at campus sites. So, for that matter, should semifinal games. But the semis aren’t going anywhere except the bowls for at least 11 years. 2. The playoff payoff will benefit every FBS athletic program. Even schools that didn’t place teams in bowls will share in the largesse. With all this money flowing in from the playoff, it seems quite unfair that families of players who will participate in the national title game must shell out huge dollars to travel twice in order to watch their sons play in the most important games of their lives. Ohio State coach Meyer and athletic director Gene Smith agree on this point, and Smith plans to do something about it. CONTINUED: ...I will initiate NCAA legislation to allow us to provide more financial assistance in the future for postseason trips. The schools could create a very specific NCAA rule that would allow the College Football Playoff to start a fund that could pay for transportation and hotel rooms for the parents of players whose performances will bring in so much money for the schools. 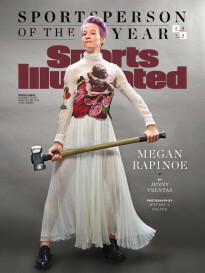 If the athletic directors and school presidents care about the athletes as much as they claim, they’ll back Smith here. 4. Since we’re already talking about the 2015 season, let’s circle one game right now. On Nov. 21 Michigan State will head to Columbus to play Ohio State. We don’t know which of three quarterbacks will play for the Buckeyes (though we know he’ll be good), but we know Connor Cook -- if healthy -- will start for Michigan State. Cook’s decision to return for his senior season, coupled with the comeback he led in the Spartans’ Cotton Bowl victory over Baylor, should give Michigan State confidence heading into next fall. With a visit from a likely Mariota-less Oregon on Sept. 12, the Spartans will have a chance to establish themselves as one of the teams to beat in the playoff race. Meanwhile, Cook can push his way up NFL draft boards. If all goes according to plan, that showdown in Columbus could be epic. 5. What happened at Texas and Louisiana Tech this past season vindicated former Longhorns defensive coordinator Manny Diaz. Now Diaz might be headed back to a Power Five league and to the site of one of his greatest successes. The Clarion-Ledger reported on Sunday that Diaz could interview for the defensive coordinator opening at Mississippi State early this week. Diaz served as Dan Mullen’s defensive coordinator in Starkville in 2010, and the Bulldogs improved from 11th in the SEC in scoring defense (26.8 points a game) to third (19.8). Diaz used that performance to land the job at Texas, and after an excellent statistical year in ’11, the Longhorns faded in ’12. Longhorns coach Mack Brown fired Diaz two games into the ’13 campaign after Texas allowed 550 rushing yards in a loss at BYU. Diaz returned to the sideline this fall at Louisiana Tech, and while Texas still couldn’t stop BYU quarterback Taysom Hill, Diaz’s Bulldogs allowed nearly half a yard less per play than they did before he arrived. As first-year coach Charlie Strong learned in 2014, the problems at Texas ran much deeper than Diaz. Diaz took the blame when he was fired because someone had to, and it wasn’t going to be Brown just yet. Now Diaz deserves a chance to coach at the highest level again -- whether it’s at Mississippi State or elsewhere. 6. Another SEC West school made a logical personnel move when Auburn hired Travaris Robinson away from Florida to coach its cornerbacks. Robinson, who played for Auburn from 1999-2002, will follow former boss Will Muschamp, who was hired as the Tigers defensive coordinator after getting fired as Florida’s head coach. Robinson was considered one of Florida’s best recruiters, and Gators officials had hoped Robinson could stay on new coach Jim McElwain’s staff. But Muschamp’s hire on the Plains made Robinson’s next destination fairly obvious, and the Tigers made it official shortly after Robinson helped Florida win the Birmingham Bowl against East Carolina on Saturday. The next former Muschamp staffer to watch is defensive coordinator D.J. Durkin. Durkin served as Florida’s interim coach for the bowl game, but McElwain has already hired Geoff Collins to run the Gators’ defense, which is why Mississippi State has an opening and could interview Diaz. Durkin worked for Jim Harbaugh at Stanford from 2007 to ’09, and the 36-year-old is considered one of the game’s brightest young minds. Could Durkin be headed to Michigan to work for Harbaugh again? We should find out soon. 7. Virginia Tech AD Whit Babcock met with local reporters on Saturday morning and told them coach Frank Beamer’s job was never in danger after a 6-6 regular season. Later, Babcock released a statement saying that Babcock and Beamer “have higher expectations” moving forward. According to the Washington Post, Babcock told reporters there were no ultimatums or “magic numbers” for next fall. Still, the release certainly read like a dressed-up win-or-else memo. Babcock only came to Blacksburg from Cincinnati a year ago. He has already fired a men’s basketball coach (James Johnson) and hired an upgrade (Buzz Williams). But this is a totally different situation. Beamer is a living legend, and has earned the right to go out on his own terms. This may be Babcock’s way of gently saying that if Beamer can’t turn the Hokies around in 2015, a change may be necessary. However, if Virginia Tech can build on its Military Bowl win and get back to ACC contention, Beamer can stay as long as he likes. The committed quarterback is Zach Gentry of Albuquerque, N.M., who pledged back in May. The available options at the position in the recruiting class of 2015 are fairly slim, as quarterbacks tend to commit early and enroll early. Still, even if Strong can’t grab another quarterback, his staff is looking more outside the state than the previous staff did. Specifically, the Longhorns are looking to south Florida, where Strong and some of his assistants found gold while recruiting for Louisville. (And where Strong recruited well as Florida’s defensive coordinator.) Since 2015 began, Texas has received four commitments from south Florida players. On New Year’s Day, Miami Booker T. Washington High defensive back DaVante Davis committed. Two days later, Davis’ Booker T. teammate Devonaire Clarington pledged at the U.S. Army All-American Bowl. In the same game, Palmetto Bay (Fla.) Westminster Christian defensive back Tim Irvin committed. On Sunday, Homestead, Fla., receiver Gilbert Johnson -- a ’14 Georgia signee who spent this past fall at a prep school in Atlanta -- added his name to the ‘Horns’ commitment list. Adding receiver John Burt from Tallahassee and linebacker Cecil Cherry from Lakeland, that gives Texas six commitments from Florida and seven from outside the Lone Star State. In the final 10 classes under Brown, the Longhorns never signed more than three players from outside Texas. 9. Co-offensive coordinator Jay Norvell is out at Oklahoma, as reported by FOX Sports’ Bruce Feldman and The Oklahoman’s Jason Kersey and confirmed by SI.com’s Thayer Evans, and more staff changes could be on the way. Sooners coach Bob Stoops is trying to fix the program in the wake of a season that began with national title aspirations and ended with a humiliating 40-6 blowout loss to Clemson in the Russell Athletic Bowl. Norvell worked with the wide receivers, and the next shoe to drop could be a change in role for fellow co-coordinator Josh Heupel, who now serves as the team’s play-caller. Stoops is only two years removed from his last staff shake-up. In early 2013, Stoops fired offensive line coach James Patton, tight ends coach Bruce Kittle and defensive line coach Jackie Shipp. That came shortly after defensive coordinator Brent Venables left to take the same position at Clemson. 10. Leaders in Oregon, Ohio, will not change the town’s name for the day of the national championship game. After two residents of the Toledo suburb created an online petition to tweak the name on the day Ohio State meets Oregon for the title, city leaders considered the idea but ultimately decided the name would stay. Instead, this will be Ohio State Buckeye Week in Oregon. This decision could set a key precedent. Now leaders at California University of Pennsylvania and its hometown of California, Pa., know they won’t have to change their names even if Cal and Penn State someday face off for the national title. I resolved to dial back the sweets in 2015. That resolution didn’t last past Jan. 2. Read on to see exactly how spectacularly it was broken. The good thing about eating in Los Angeles? Most of those beautiful people love to eat healthy, and there are so many of them that restaurants are forced to make healthy food that also tastes great. 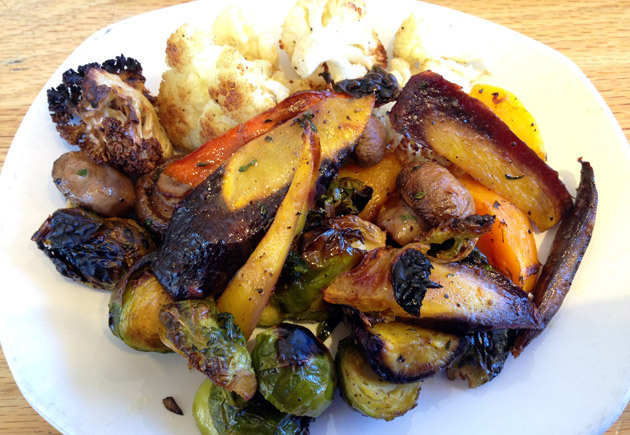 So, it’s easy to find a Southern California-based chain such as Tender Greens, where the vegetables are seasonal (beets, squash, Brussels sprouts, etc.) and grilled and the steak salad comes with a fiery horseradish vinaigrette. Of course, there are plenty of regular folks in America’s second-largest city, and they crave fat and sugar as much as I usually do. That’s how I wound up dunking chip after chip into the fresh chipotle salsa last Monday at Yxta before devouring Dos Gringas. That’s two tacos filled with perfect al pastor pork and avocado salsa. I followed this with pepitos encrusted scallops atop queso fresco potato pancakes and a few bites of a friend’s carnitas, which were the star of the night. I didn’t try the blood orange margarita, which drew rave reviews from across the table. I might on my next visit. I kept things together through the Rose Bowl, but when Oregon’s win necessitated I remain on the West Coast through Monday, I suddenly found myself with a free Friday in L.A. That’s when my New Year’s resolution went off the rails. Breakfast wasn’t anything special, but I was only conserving my gustatory energy. For lunch, I visited the Curious Palate in Santa Monica. 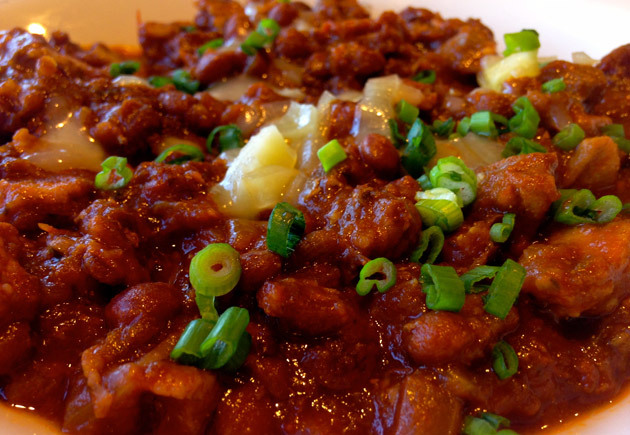 The place has a sister restaurant in Venice, and each serves a delicious double pork chili that mixes roasted shoulder with bacon, ale, pinquito beans, apricot and dried chilies. 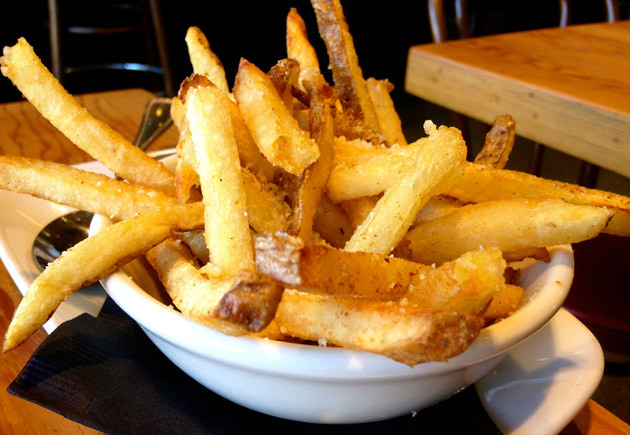 Since every meal needs a quality starch, I ordered white truffle fries with aged Monterey jack cheese. I also may have dipped a few fries in the chili, though they needed no accompaniment. It was the first Friday of the month, which meant the food trucks would park along Abbot Kinney Boulevard in Venice that night. The Kogi BBQ truck, which has made several appearances in the “On the menu” section of my Walkthrough column, is a mainstay at First Fridays. It was in line for this truck that I met my friend and food Sherpa Dan Rubenstein, who grew up in the Valley and had come west to visit his family and his lovely girlfriend, Jodi. Alas, Dan had not prepared Jodi for the display of dining stamina she was about to witness. Typically, those who wish to eat the delights produced inside one of the three Kogi trucks must follow @kogibbq on Twitter and chase them around the Southland. On First Friday, one truck is easy to find. Look for the longest line. I ordered three short rib tacos -- which are exactly what you’re imagining, but better -- and a blackjack quesadilla, which features pork, grilled onions and cheddar and jack cheese sandwiched between two tortillas. The creation is then grilled and drizzled with fresh salsa verde. I ate all the tacos. We split the quesadilla. Half for me. Half for the other two. Next, we moved over to the Seoul Sausage truck. The special of the evening was Galbi Poutine, which mixed eight-hour braised short ribs atop twice-fried french fries with cheese, kimchi pickled onions and avocado lime crema. We shared an order, and never have Canadian-Korean relations tasted so good. Dan and Jodi, who together do not weigh as much as me, had eaten their fill. I still craved dessert. Fortunately, the Coolhaus truck was happy to serve me a double-decker ice cream sandwich of my own design. Of course I ate the whole thing. If I’m going to break a New Year’s resolution, I’m going to absolutely destroy it.